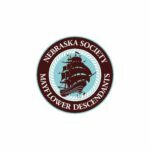 Beautiful new Nebraska Mayflower lapel pins are available now for a $10 donation to support the General Society’s acquisition of the First Parish Church in Plymouth. 1. Make a $10 donation at the November Annual Meeting. Pins can be picked up at the meeting. 2. Make an $11 donation online at NebraskaMayflower.org (includes $1 for packaging and mailing). At the top right of the homepage, click on Dues and Donations to make a donation securely though Paypal or by credit card payment. 3. Send your $11 check (includes $1 for packaging and mailing) to Kathryn Morrissey, First Parish Church Project Chair, 681 North 57th Ave., Omaha, NE 68132. Show your Pilgrim Pride and support the General Society’s preservation of the Pilgrim’s First Parish Church and Meeting House in Plymouth.